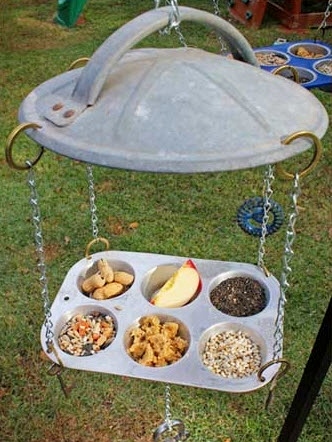 Make a muffin pan into a bird feeder! Drill a hole in each corner of the pan and drill a hole in the bottom of each muffin cup for drainage. Select a baking pan, sauce lid or wood board for the top of the feeder and drill a hole in each corner of the lid. Attach a drawer handle or eye bolt to the top of the lid for hanging and attach a small hook or door handle to the bottom of the muffin pan to hang a counterweight, such as a wind chime or skeleton key. Attack a key ring to the holes in the muffin pan and lid pan, and attach chains to each of the rings. Hang the bird feeder and fill each of the muffin cups with foods for various birds, such as suet, sunflower seeds, unsalted peanuts and fresh fruit.